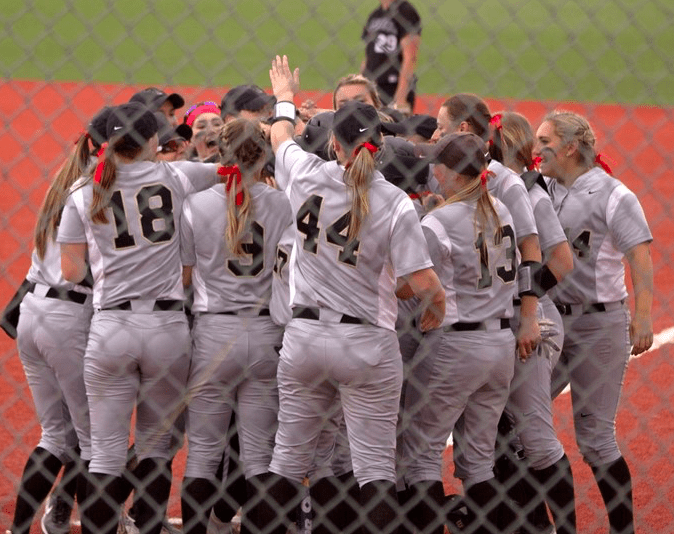 Balancing academic studies and athletics in the UCCS Softball program is of great importance for both the team and the coaching staff. The National Fastpitch Coaches Association awarded nine softball players Scholar Athlete recognition in September. The award requires a minimum of 3.5 GPA in at least two semesters of attendance for the 2016-17 school year. The players awarded include senior utility Megan Duffy, senior catcher/ third base Claire Nibbe, senior infielder Nikki Hoffman, junior catcher Makenna Smith, sophomore catcher Kennedi DeRossett, junior outfielder Whitney Weber, junior first base Lexi Belligan, sophomore outfielder Leigh Lancaster and freshman catcher Taylor White. Head softball coach Ricki Rothbauer said the award gave recognition to her players’ progress as both students and athletes. “For [Division II] teams at least, I think that it really does a good job of awarding kids off the balance in their lives between academics and athletics,” said Rothbauer, who has coached the team for the last three seasons. The team has a 3.37 cumulative GPA overall, which placed at No. 53 on the NFCA’s list for team GPA’s, according to Rothbauer. “I like for our kids to have reason to compete in the classroom, and obviously with our department doing as well as it has academically for several years now, I think that day to day couple of awards that we can talk about can incentivize just a little bit more,” said. Rothbauer. Members of the team who accepted the award expressed its importance. For Weber, who was a member of the RMAC All Academic First Team last spring, the award encouraged her drive as an athlete. Weber has a 3.9 cumulative GPA, making her one of the team’s top academic performers, according to Rothbauer. “The Academic First Team award, for me, was another form of encouragement to keep up my efforts and my drive to be successful,” said Weber, a senior criminal justice major. Belligan, a senior criminal justice major, was also a part of the RMAC Academic Honor Roll. “Being a student athlete is difficult at times but extremely rewarding at the end of the day. Going from class to workouts and workouts to practice can be draining, but being a part of a college athletic program is such a privelage,” said Belligan. As a coach, Rothbauer has had to experiment to see what the best way, as a coach is to support the players with their academic studies. “It’s very difficult. We have so many ranging majors within our group, so we’ve kind of played with the idea of different types study halls and it’s been a team discussion for a long time,” she said. The team and coaching staff decided on a weekly plan in which each player gives their schedule in order to organize time management and keep up with their homework and studies. The regular season opens at home in 2018 beginning with a three-game series versus Fort Hays State on Feb. 3-4 at the Mountain Lion Field.